UCHealth launches Black Friday Checkout initiative to encourage people to get off their phones on the day after Thanksgiving and spend device-free time with family and friends. In a recent survey of Coloradans, UCHealth found that 48 percent of those surveyed feel that social media has a negative effect on personal and family relationships, and 60 percent spend more than an hour on their mobile device every day. With some phones releasing new settings that notify users of their screen time, it’s no secret that mobile devices are increasingly seen as both a blessing and a curse. UCHealth is creating a variety of activities on Black Friday to encourage people to log off and “check out” from their devices and social media to spend time with friends and loved ones. In its first year, UCHealth’s Checkout campaign will host events and activities for people to participate in on Black Friday helping them reconnect with the people they love. UCHealth will be going dark on all social media accounts on Black Friday as well and hopes the activities provide families with options other than screen time for bonding and having fun. UCHealth is creating a variety of activities on Black Friday to encourage people to log off and “check out” from their devices and social media to spend time with friends and loved ones. One of those activities is to play catch with Chris Harris Jr., Case Keenum and other Broncos at UCHealth Training Center. Photo by UCHealth. On November 23, UCHealth will sponsor numerous activities to help people Checkout and tune into their family and friends. A collection of Colorado athletes, sports teams and mascots including representatives from the Denver Broncos and Colorado Avalanche are partnering with select Checkout events to raise awareness of this initiative. Information on events and registration can be found here as well as some tips for how to “check out” and be present beyond the holidays. Video interviews from UCHealth experts are available at this link. 11 a.m.: Free private screening of the movie Ralph Breaks the Internet at Cherry Creek AMC 8. 11 a.m. – 2 p.m.: Community paint-by-number mural with local artist Kiri Jones in the 900 block from Curtis to Champa streets; hot chocolate and music at lunchtime! 12:30 p.m. – 1:30 p.m.: Storytime at the Denver Center for the Performing Arts with David Lee Bruton Jr. prior to the afternoon performance of Corduroy and A Pocket. 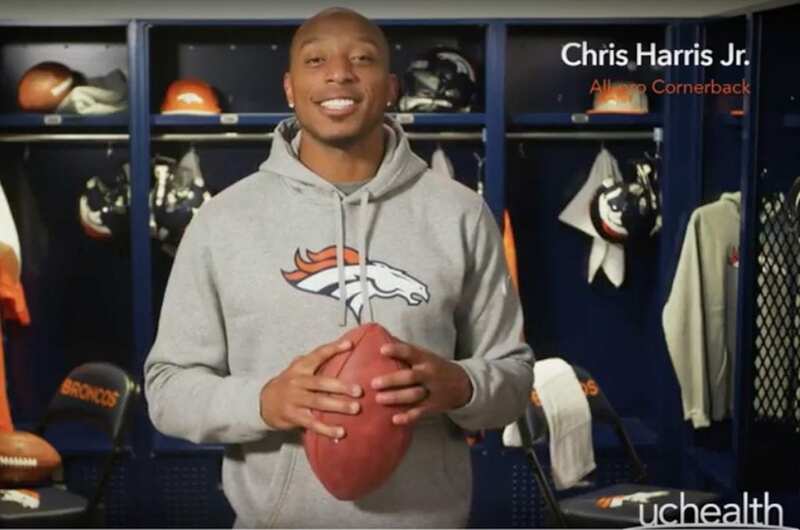 3:30 p.m. – 4:30 p.m.: Play catch at the UCHealth Training Center with Chris Harris Jr., Case Keenum and other Broncos players. 12:30– 3 p.m.: Complimentary open skate session at Family Ice Arena in Centennial. Screen time and blue light after dark can create difficulty falling asleep. Social media use is associated with increased rates of depression and increased rates of suicide and suicidal thoughts for adolescents. Too much screen time is associated with dry eye, digital eye strain and childhood myopia. After November 23, UCHealth will be sharing photos and video from these events to motivate and share tips for checking out, any time. Follow @UCHealth on social media and share photos after your day of play to keep the conversation going throughout the holiday season. UCHealth isn’t asking people to give up their screens completely – just to check out by taking a break and enjoying the simple things in life.